Mrs. 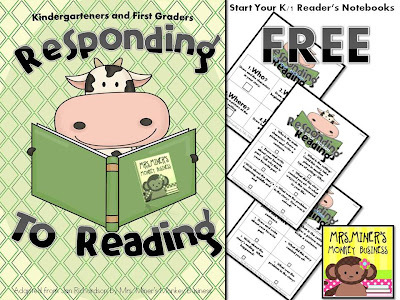 Miner's Kindergarten Monkey Business: Reader's Notebook FREEBIE for the Young Ones! Reader's Notebook FREEBIE for the Young Ones! So, as I head to first grade, I am realizing that there are lots of changes to come. Some will be small, some will be bigger and some will be just plain FUN! Take for instance the Reader's Notebooks I will be implementing for my students to use to respond to their individual, independent reading. I can't find anything that will work for the kiddos I am having (although I'm sure they are out there somewhere! ), so, I have to create my own. While doing so, I thought I'd share what I have so far with you, which is just the fiction tables. Basically, my students will house this checklist (along with the non-fiction response table which is COMING SOON!) in their Reader's Notebook along with lots of paper. The students will choose which section they want to respond to their book to as an "independent learning activity" during Reader's Workshop.... I provide 3 levels (to allow for differentiation of course!) and each level gets a little more challenging. Start simple and work your way up with your kiddos! I hope this helps you get started or refresh your Readers' Notebooks! I know my students are going to love being in charge of their own learning during Reading Workshop! Click on the picture above to grab this freebie! Click here to read my post about creating independent learners so you can pull small groups based on Jan Richardson's book The Next Step in Guided Reading! Follow along as us girls from Freebielicious read this book and share our findings and freebies with you! I love to scroll through my google reader to read all of my favorite blogs, so I was really sad to find out that as of July 1st, Google Reader WILL NO LONGER EXIST! Booooo! 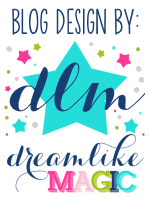 But, thanks to all of my bloggin' buddies who are always right on top of things like this, I've been led to Bloglovin' which is SO EASY to sign up, and automatically transfers all of the blogs you follow in google reader currently to their site. Easy Schmeasy! Click on the link at the very top of this blog post and you will be good to go! Good luck and let me know how it goes OR how you keep up with all of your favorite blogs in the comments below! I linked this up to Classroom Freebie's Manic Monday, click below to find some more quality freebies for your classroom use! These reading response activities are perfect! Thanks for the freebie! I took time to explore Bloglovin' and Feedly but wasn't super excited about either for various reasons. My husband (a web developer) did some more exploring for me today and came across The Old Reader (modeled after the "old" version of Google Reader)........ I think I'm sold! It's very similar to Google Reader without the kinks that were bugging me about Bloglovin' and Feedly. Thank you so much!!! 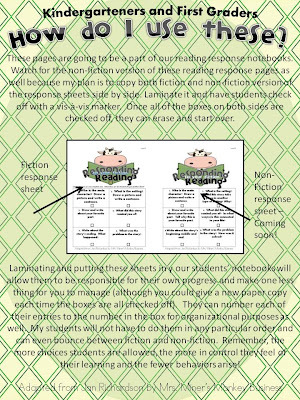 I love these for my writing about my reading notebooks- thanks for sharing! Thank you so much! I am praying for a transfer to Kindergarten in Abu Dhabi. I should hear in the next week but of course I am already planning for a change just in case. Thank you for sharing! I am so following you through this transition because I am moving from K to 1, also. Even after18 years teaching, I am still learning. You are all so welcome! Thanks for stopping by and checking this out! Make sure to follow me so you know when the non fiction ones are posted! I can't wait to try this out with my daughter. Thank you for sharing these. I read this yesterday but didn't look at the freebie until today. Thanks for sharing! I can see how this would be a very helpful independence-building tool in the first grade classes I've worked in. I think that if I attempted something like this in K, I would put the sheets in page protectors and have the kids write on them with dry erase or washable crayons. Those are a little less messy than Vis-a-Vis markers! And then you don't have to worry about laminating everything and can change up their level easily. Just a thought!